I got to make Solange rooibos tea – one teaspoon of sugar and no milk. I thought I would be immune to being starstruck, but I made sure to remember her order like I do my ID number. Fantastic two days on set. All in all, it was an exhilarating experience. Solange is a true ELLE Belle. Her eclectic, vibrant style inspires so many people. Not only is she a style icon, she juggles motherhood and her career seamlessly too. 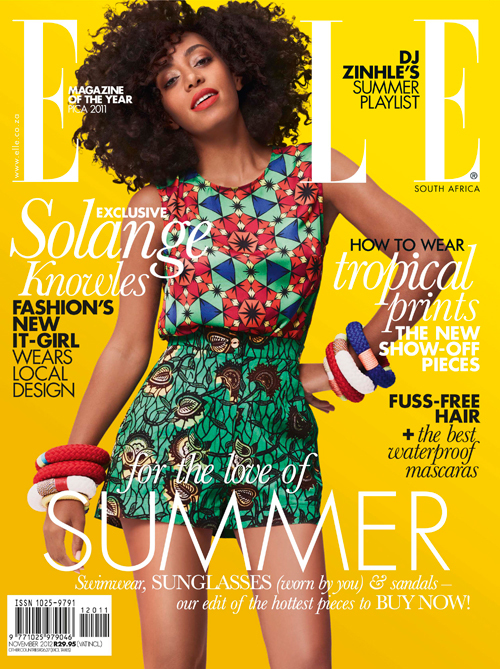 I was with the ELLE team to meet Solange the day before the shoot at Roodebloem Studios. The day was set aside for Solange to try on all the outfits the fashion department had sourced. It was amazing to see Solange in person; her bubbly personality shines through and she is such a natural beauty. I love that she embraces her natural hair and she has flawless skin, but I must say, she was even more striking after she stepped out of the hair and make-up room. Hairstylist Kevin Epstein worked his magic and make-up artist Algria Ferreira used Rimmel’s Lasting Finish 25 Hour Foundation on her skin (she is the face of this amazing new foundation range), as well as adding bright, matte orange lips. I felt so lucky to be on set and see the whole thing come together. There are moments in an editor’s world that go beyond our wildest dreams, but then again, some of them come true precisely because we have the power to imagine – and because we are constantly entertaining ideas that will whet your appetite for the unexpected and delight you with the style and substance ELLE stands for. Shooting Solange Knowles was an amazing experience, but not one without challenges. When styling models, it’s great if they like the clothes, but they never get a say in the wardrobe choices. Shooting celebrities, especially those of Solange’s status, is another story altogether. Solange didn’t want to wear everything that I suggested to her, but, thanks to her amazing personal style, this wasn’t a sartorial issue. It was really encouraging to see how much she appreciated our local designers and in today’s market we need the kind of exposure that people like Solange can provide for South African talent. She was completely natural in front of the camera and it was amazing to see her perform and sing. The last shot of the day was my best moment. The shoot was a huge success. She looked fantastic and the team worked exceptionally hard on the project. It was a ‘phew, we did it’ moment. The drive to the airport seemed to take forever and I had to constantly remind myself to breathe – I am a huge fan of the Knowles family. Even after a long flight, Solange still looked fresh and beautiful and greeted us all so warmly. My interview with her was an incredible experience. We sat in her penthouse at 15 on Orange on the Thursday night and chatted while she had her nails done. It didn’t feel like a formal interview at all, and we chatted our way through the points I wanted to cover. The sense I got throughout the interview was that she is a real person; a young mom who is doing what she loves. A highlight for me, besides meeting her of course, was seeing her work her magic in the studio. At one stage there was a total of 15 minutes where I just stood and watched her – it was such a ‘pinch me, I must be dreaming’ moment. Being able to witness all the pre-production work come together is something I’ll never forget, and I felt so proud to be part of the ELLE team. What Solange wore on the cover: Tart top, Loin Cloth & Ashes shorts, and Pichulik rope bracelets. To view behind-the-scenes footage of Solange embasking in South Afirican designer fashions click here. One of my favorite style icon’s Solange is featured in the latest issue of Lurve Magazine. She had an open discussion about her hair, fashion choices, Carol’s Daughter, and having less boundaries than Beyoncé growing up. This wouldn’t be an interview without a fab fashion spread. “I made some comments on Twitter recently about an article someone sent me that a young writer wrote about how much energy we are putting into other people’s natural hair. I thought it was really interesting, and in a lot of ways true. That is until I came across the part of the article that mentioned how certain commenters were debating on the texture of my hair in its natural state. Solo you don’t have to explain your hair or fashion choices to anyone. Just do you! Below I have listed the nominees for the October 2011 Style Icon. I will do a post on the winner in three weeks so make sure you vote on whom you feel should win. Gwyneth Paltrow style has not changed a lot over the years because she knows that simplicity is chic. Gwyneth has the minimalist trend down to a tee. Gwyneth also knows that sometimes wearing pieces in a popping color can make any person take notice. It seems that Calvin Klein is her favorite designer as of now probably due to his less- is- more design ethic.